May 4, 2014 Posted by AAfterwit on May 4, 2014 | Comments Off on Perception Of Racism. This past Wednesday night, the Montreal Canadians beat the Boston Bruins in double overtime 4 – 3. With 4:19 left in the second overtime, Montreal defenseman P.K. Subban fired a slapshot past Boston goalie Tukka Rask for the game winner. Canadian fans were ecstatic. Bruin fans, not so happy and took to Twitter to voice their displeasure. The target of the fans anger was the aforementioned Subban, who is black. Tweets from fans rained down against Subban using racial terms and epitaphs that would make a sailor blush. It was vile, stupid, wrong, and every other adjective we can think of that would decry this type of bigotry. You would think that after a week of the mess with Donald Sterling, people would know better. It is okay to dislike a guy because of the uniform he wears, but don’t hate a man because of the color of his skin. 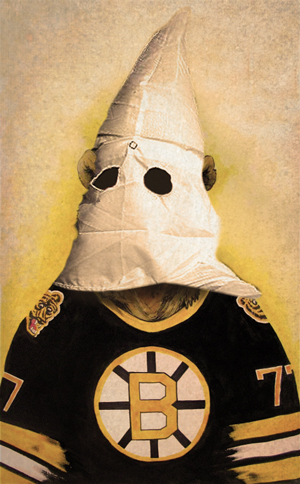 What is missing from the condemnation of Sterling and the Bruins fans is the overall condemnation of whites, of males, of conservatives and of Republicans if the incidents had taken place south of the Mason-Dixon line. You would have heard that Sterling was typical of the people in the south – racist, white and conservative. Yet Sterling is from Los Angeles, a town that leans to the left politically. Sterling himself is a supporter of liberal and Democratic causes. Boston is a city than decidedly leans to the left yet no mention of the political leanings of city or the state is made. If the same tweets had occurred while the Canadians were playing the Nashville Predators, the Carolina Hurricanes, or the Atlanta Thrashers, would the city, the state, and the fans have gotten a pass as Boston and Sterling did? Would the press had dug deep into other racial incidents with owners, teams and fans if these incidents had happened in the south? You bet they would have. We once worked with man of African American ancestry who had lived in rural South Carolina, rural Georgia, Atlanta, Boston and New York. He swore that the worst racism he ever faced was not in the South, but in northern states with traditionally “liberal” leanings. To us it means several things. First is that the reporting of racism can be used as a weapon. Either Boston and Sterling deserve the same type of “paint with broad strokes” as people in the south get when there is a high profile case (such as the Zimmerman case) or people in the south deserve the same distinction that the Boston and Sterling incidents were not indicative of a whole population, city, state, ethnicity or gender. Secondly, these recent incidents show there is still work to be done in the area of race in this country. To deny otherwise would be ridiculous. The United States is not the only country to have racial problems. In “enlightened” Europe, for example, people of different ethnic backgrounds are regularly subjected to racial taunts, remarks and denial of opportunities. It isn’t just the United States and just as importantly, it isn’t only white conservative males. Racism is everywhere and the only way to stop or decrease it is to point out the racists, call out those racists and then not claim that everyone in the racist’s state, country, town, ethnic background, gender or political leaning is a racist by extension. Labeling everyone based on the behavior of one person is crazy and wrong. In fact, it is the basis of racism. Too many times we have heard of situations where a person of one ethnicity hates an entire ethnic group because of something that one person of that ethnic group did. If it is wrong to paint an innocent group because of the actions of one person of a certain ethnicity, it is wrong to paint those of the same ethnicity of a racist as somehow being all racists. It doesn’t matter what color people are, what gender they are, where they live, or even their political leanings. We all have the ability to be racists. We may never see the end of racism, but it is important to note that to end racism, we have to not only see it where it exists in others, but also to make sure that we aren’t exhibiting racist ideas ourselves. Like it or not, racism begins at home.